Some 700 000 years ago descendants of the first humans started migrating southwards from central Africa. We still find the stone tools and rude rock shelters of these first Cape people. Artifacts dating from the Middle Stone Age (125 000 to 30 000 years ago) prove that those early humans were already making fires in their shelters and that they had tools at their disposal for hunting and for preparing and transporting food and water. About 30 000 years ago a particularly long, dry period isolated the inhabitants of the West Coast from the central Negroid tribes to the north. This led to the evolution of the Khoikhoi and San peoples, with their distinctive physical characteristics. 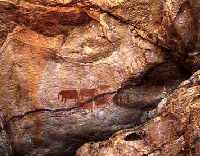 The shell middens of these first West Coasters are dotted along the Atlantic coast at frequent intervals and their rock paintings still decorate many shelters and caves in the Cedarberg Mountains and vicinity. The Khoi started herding sheep from about 2000 to 1500 years ago. With the arrival of the Dutch settlers in the seventeenth century there were some 17 000 to 18 000 Khoikhoi herders at the present-day Velddrif, between Cape Town and the Berg River. The Portuguese navigator Vasco da Gama, who landed here in 1497, was probably the first European whose arrival was recorded. He landed somewhere near the mouth of the Berg River, and gave the sheltered bay he found there the imposing name of Bay of Saint Helena, in honour of the pious mother of the Emperor Constantine the Great, under whose reign Christianity became the official religion of the Roman Empire in the year 313 AD. In 1969 the government of Portugal erected a granite monument to commemorate this event. The monument stands on the shores of the bay, still known as St Helena Bay, between Sandy Point and Stompneus Bay. Apart from the fact that Da Gama discovered a sea route between the West and the Far East, his arrival was an event of great importance to Christianity. The beach at St Helena Bay was the first place in southern Africa where the Pater Noster was said. The village of Paternoster, to the south of Stompneus Point, was so named to commemorate this event.